What is a cave? Loosely, many people refer to any hole in the ground as a cave, whether it is natural or artificial. To cavers, though, caves are natural holes in the ground, usually formed by water in limestone although they can be formed in sandstone, gypsum or igneous rocks and by water, wind, lava or tectonic movements. Another common question is how do caves and potholes differ? Most cavers will usually tell you that they are more or less the same although potholes tend to have a vertical entrance whereas caves have a horizontal entrance; for this reason, the name potholes is commonly associated with caves in the Yorkshire Dales and caves with Derbyshire, South Wales and elsewhere. And then of course one has to wonder why people visit caves at all. Caves have been homes since homo troglodytes (Caveman) lived there and people still live in caves in some parts of the world. However, in Britain, it must have become obvious to people fairly early on that it was a lot warmer to live in an above-ground house than to try to make a natural cave warm. Caves then became a source of mystery and probably harboured all sorts of spirits, in the minds of the people of the early centuries AD. By the 18th century, explorers were starting to ask what caves were and where they led and the sport of caving developed. By the 19th century, visits to caves were not uncommon but potholes still posed a problem. This developed and there were a number of regular cavers by the early 20th century. Caving developed slowly over the 20th century until the 1950s when people started to have time and money to allow them to travel more. As a result, many clubs are reaching their 50th birthday about now. Caving in recent years has changed as more people sample caves at outdoor activity centres but less join clubs. In part, this is because the equipment is more affordable and easier to buy and carry but the sport as a whole is a bit concerned about dwindling numbers. To find out more about where you can go caving, look on the page about caving areas in Britain. 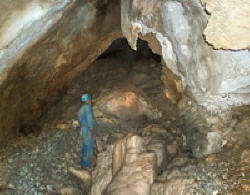 To see some pictures, have a look at our caving photo gallery.